Football season is around the corner and I vowed that I wouldn’t write my division and team ranking blogs until training camp. Well yesterday a conversation amongst a couple of people on twitter about the Miami Dolphins motivated me to start this nine part series today. I am not trying to prove a point or anything. I think my knowledge of the game of football whether its college or pro speaks for itself. Anyone who knows me personally or has been following me on twitter for awhile can attest to this. Bottom line, I am rarely wrong when it comes to football. You may not like what I have to say or may think I am borderline clueless at times with my Skip Bayless like comments. But like Skip, usually what I say comes true or almost does. I am a realist and the truth hurts sometimes. Unlike most people, I am able to analyze the game of football without rose colored glasses on. I am a Texans and Patriots fan, but I will criticize everything and anything they do also. I favor no one when it comes to the truth. So let’s get into day one/blog entry number one of my nine part NFL division and team rankings blogs. Parts one through eight is going to be divisional analysis with the ninth entry being team rankings. Today we will begin with the AFC East. This division has never really been a strong division. For the exception of last year, it’s been the New England Patriots and everyone else. From time to time, the New York Jets, Miami Dolphins or Buffalo Bills will have a decent year and challenge New England or maybe win the division. But it isn’t the norm. Things should be a lot different with New England aging and the Jets and Dolphins getting better. New England will still be New England, but the Jets have shown that they can beat New England and Miami can give them a run for their money too. Buffalo isn’t even ready to compete with themselves yet so no need to think about them competing with the previous three that I just mentioned. New England Patriots – The Patriots are a aging dynasty that is in the midst of retooling, not rebuilding. New England had one of the best drafts in this year’s draft and was able to address lots of needs both of the defensive and offensive side of the ball. 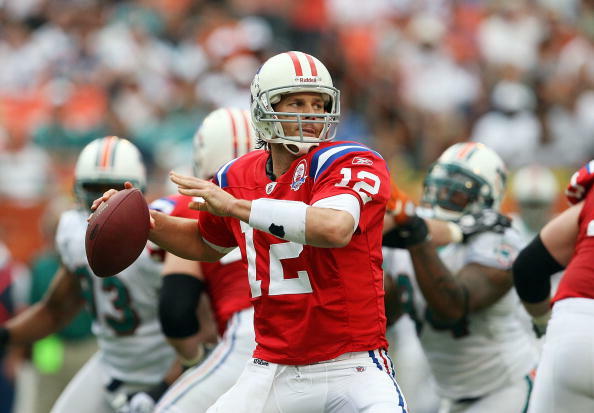 Offensively the Patriots will be ok as they always have been. Will they be as explosive as they were in 2007? No, but they will be just as effective as they were last year and should be a little better with Brady having a full season under his belt after missing a year to knee surgery. Most of New England’s offensive issues last year came from Tom Brady who wasn’t comfortable playing with his surgically repaired knee. Brady wasn’t stepping into his throws most of the time and wasn’t comfortable with “trash” around his legs while in the pocket. Another major issue in New England last year was that the new players were not learning or buying into the system (Joey Galloway). Wes Welker is another big concern for the Patriots offense. Question still remains as to how he will bounce back after the season ending knee injury that he suffered against the Texans in the last game of the season. If he returns and is the Wes Welker that we all know, then all is good in Boston. Defensively New England should be better but I am not going to put my name on that prediction. Last year the defense was atrocious and lost a lot of games for the Pats. Bill Belichick fired Dan Pees who was the defensive coordinator over the last couple of years in New England. Bill went ahead and announced that he was taking over the play calling for the defense this year and no defensive coordinator would be named. With the genius calling the plays on defense, and with the new players that they acquired on defense during the offseason. This year’s defense should be much better than last year’s defense. I will admit though, I am taking a wait and see approach to that prediction. One thing that New England must do if they don’t do anything else is improve their run defense. They were fourth in the NFL in giving up the most yards per carry to opposing teams. In the end I see the Patriots finishing 12-4 if all things go well. Or 10-6 if they don’t get their defensive issues fixed and their running game and Wes Welker don’t play well in the first half of the year. Games against the Vikings, Packers and Ravens are games that can go either way and can give New England problems if their secondary isn’t on point. New York Jets – I have gone on record as saying that I am not completely sold on the Jets being what everyone is saying they are, a championship contending team. They made some really nice moves during the offseason and then made some questionable ones. 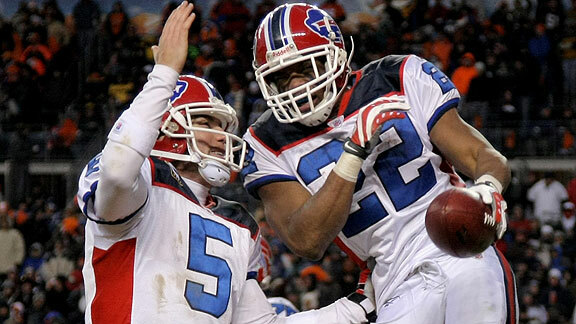 Releasing Alan Faneca and trading Leon Washington could come back to haunt them. Offensively everything relies on the maturation process of Mark Sanchez. In this being his second year, he needs to be able to take that next step that rookie QBs have to take in order to become a legit NFL quarterback and take his team to that next level as a Super Bowl contender. He was way too inconsistent last year and hurt his team more than he helped which is typical of rookie quarterbacks. The addition of Santonio Holmes and LaDanian Tomlinson should give Mark the weapons he needs to help turn the Jets offense into an efficient and formidable one, but it all comes back down to Mark being smart with the football. The Jets have already become known as a defensive team in just one year. The defense is the strength of this team and most likely will always be. They were the number one ranked defense last year, and I expect them to be even better. Having Antonio Cromartie and Darrelle Revis on the corners with that pass rush isn’t something that teams in the AFC are too excited about having to face. First round pick Kyle Wilson was a great draft day selection that allows Rex to have a good speedy, physical cover corner on a team’s slot receiver (Wes Welker). 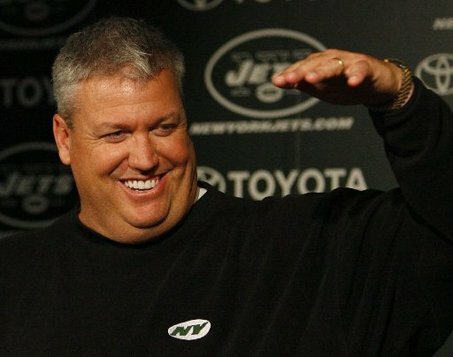 Rex Ryan loves having really good cover corners because it allows him to do so much with his scheme. When Rex was in Baltimore, he was always begging Ozzie Newsome to draft certain corners for him to have on defense. Ozzie declined 95% of the time. Well now Rex has his corners, three really good ones. That Jets defense is going to be scary good. New York should either finish 13-3 or 11-5. 9-7 if Mark plays inconsistent like he did last year. Vikings, Texans and Packers are games that the Jets may struggle in. Offensively these teams can put it on ya. Miami Dolphins – Miami is one of those teams that you look at and you ask yourself how are they able to do what they do with what they have. They don’t have one or two guys on their entire roster that is ranked in the top ten in any position except for maybe Brandon Marshall now. 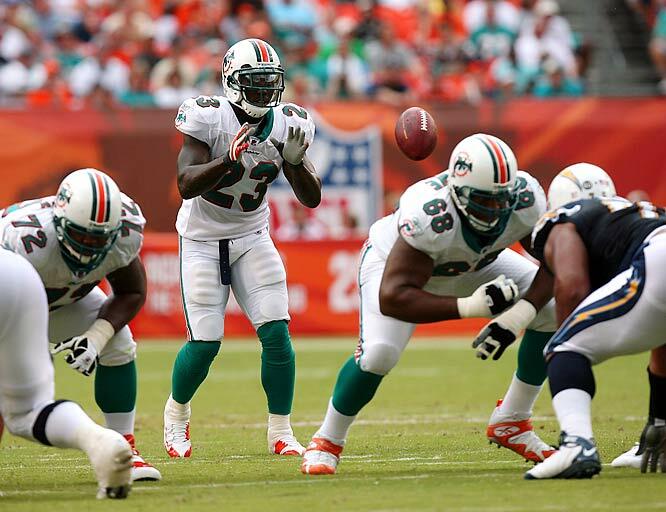 The Fins have question marks up and down their roster that is littered with “B” level talent and unproven players. Unless you are a Browns, Bills, Chiefs, or Seahawks and maybe a Raiders fan, you’re not really worried about the Dolphins beating your team are you? They just don’t have it all together yet to really make you scared. I have to admit that I don’t even watch the game when Houston or New England plays Miami. The Dolphins haven’t handled any one of those two teams yet so I have no worries. Losing Jason Taylor and Joey Porter will hurt immediately. Jared Odrick and Koa Misi aren’t ready to step in and produce at that level yet. Second round pick Koa Misi who is a DE, is being converted into an outside linebacker. It takes three to four years for DEs to make that transition to outside linebacker. So don’t expect Miami to have a great pass rush this year. Karlos Dansby helps but he can’t do it by himself, and Channin Crowder benefitted from Jason Taylor and Joey Porter being there. Miami brought in Brandon Marshall to add some punch to their offense and to give Chad Henne a big time target at wide out to throw to. Marshall is a great addition to that almost anemic offense, but he isnt the overall answer. There are two major issues with Miami’s offense; one is that as talented as Chad Henne is, he needs time to develop. Expecting him to go from where he was last year to good over night won’t happen. Brandon Marshall helps, but a QB and a wide out need time to get on the same page. Brandon Marshall is an extremely talented wide out, but he may not get properly used in Miami until they change their offensive philosophy. Think about it, in Denver he played in Mike Shanahan’s west coast offense. Then he played in Josh McDaniel’s pass happy version of the Erhardt-Perkins offense. Miami tries to run the run oriented version of the Erhardt-Perkins offense that has about 80% of the “wildcat” mixed in. The old saying of “don’t count your chickens before they hatch” applies to the Marshall in Miami experiment. On the defensive side of the ball their secondary is bad and they have no pass rush. They did address both areas in the draft and should be better overall defensively. I like the Dansby free agent signing and the draft picks of Koa Misi and Jared Odrick. Those three guys along with the DBs and defensive lineman they drafted should significantly improve this defense. I just don’t expect great things from them until two years from now. Miami has a pretty tough schedule and as I was tweeting yesterday. I was having a hard time finding more than five games that they would win. At best I have them going 7-9 with some lucky breaks, and 6-10 as the most likely scenario. Three games that are hard to call are the Tennessee, Oakland and the Detroit game. I can’t see Tennessee being a bad team again and Oakland is going to be a good team. Not playoff good, but a team that goes 8-8 and will not be an easy win for some teams. Detroit is a team that has made a lot of great offseason moves over the past two years. Everyone including myself loves what Detroit has done. Check the roster and game film from all sixteen games last year and you will see what I mean. The Lions may not be an easy win if at all a win for Miami. I don’t think that Miami is a bad team; I just think that their talent level and many question marks on both sides of the ball don’t put them in a favorable position for this year. Especially with them playing in a tough AFC division and conference. Buffalo Bills – Where do I start with this team? Will we see paper bags back on Bills fans heads at games this year? This team is bad and is going through a rebuilding year/phase with a new head coach in Chan Gailey who shouldn’t have even gotten the job. Brian Billick or Leslie Frasier would have been much better choices than a retread in Gailey. Talent wise they don’t have much if any except for C.J. Spiller who will be an amazing player, but may have a hard time his first two years being effective with the lack of offensive line help and overall talent on offense. Offensively they have questions everywhere except at running back. Trent Edwards hasn’t officially been given the job yet in Buffalo, but the other quarterbacks on the team aren’t anything to be hopeful about anyway. Buffalo will struggle worst than what they did last year offensively. I don’t see where or how they will be able to generate offense with the players that they currently have. If you’re a defensive coordinator, you put eight or nine guys in the box a double Lee Evans and tell the equipment guys to start packing up stuff and for the bus drivers to keep the busses running. Defense is something that may go from bad to worse as they are transitioning from a 4-3 defense to a 3-4 defense. There isn’t much talent on this Bills defense that was one of the worst teams on run defense last year. Gailey didn’t do too good of a job drafting defensive players that will fit his 3-4 scheme in this year’s draft. That’s not good news when you are transitioning from a 4-3 to a 3-4 and you already don’t have talent on that side of the ball. I don’t see Buffalo winning more than one or two games this year unless they catch a team slipping. I expect a 2-14 season at best or 1-15 if things really get bad. But then again things are already bad in Buffalo.